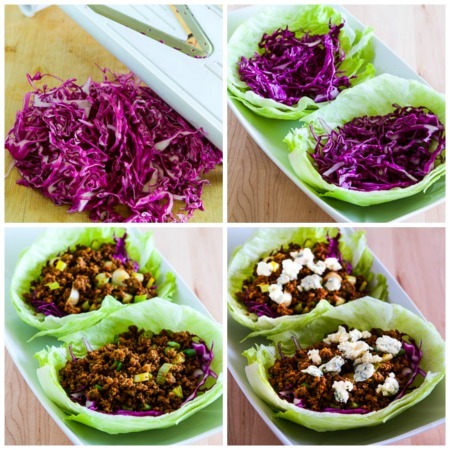 I love these Buffalo Turkey Lettuce Wraps with buffalo-spiced ground turkey, thinly sliced red cabbage, and crumbled blue cheese folded inside iceberg lettuce. 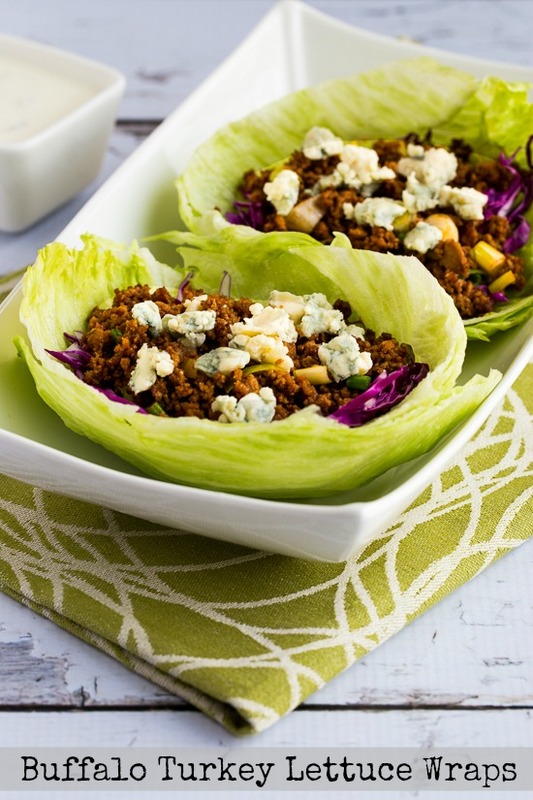 These tasty lettuce wraps are low-carb, low-glycemic, gluten-free, and South Beach Diet friendly and can easily be Keto if you switch the turkey for ground beef. Use the Diet-Type Index to find more recipes like this one. Click here to PIN Buffalo Turkey Lettuce Wraps! Watch the Video to see if you might like to make Buffalo Turkey Lettuce Wraps! This recipe for Buffalo Turkey Lettuce Wraps is my latest low-carb recipe creation using Frank’s Red Hot Sauce, and I promise to any Buffalo Sauce avoiders, this is the last recipe with this spicy sauce for a while. On the other hand, if you’re a big fan of Frank’s like I am, check after the recipe for links to my other tasty ideas with Buffalo Sauce! This recipe has a generous amount of hot sauce, so we’re relying on the thinly sliced cabbage, iceberg lettuce, and crumbled blue cheese to turn down the heat a little. We loved this when we tested the recipe; hope you enjoy! Edit: Buffalo Turkey Lettuce Wraps was featured in the Top Ten New Recipes of 2015 (plus Honorable Mentions). While the meat cooks, use a mandoline slicer or a sharp knife to thinly slice about 1/2 head of red cabbage. Make cups from Iceberg lettuce, fill each one with some cabbage, add some of the spicy Buffalo turkey and top with crumbled blue cheese. Enjoy! For a delicious low-carb meal, add an easy side dish like Cucumbers Caesar or Kale and Romaine Caesar Salad. 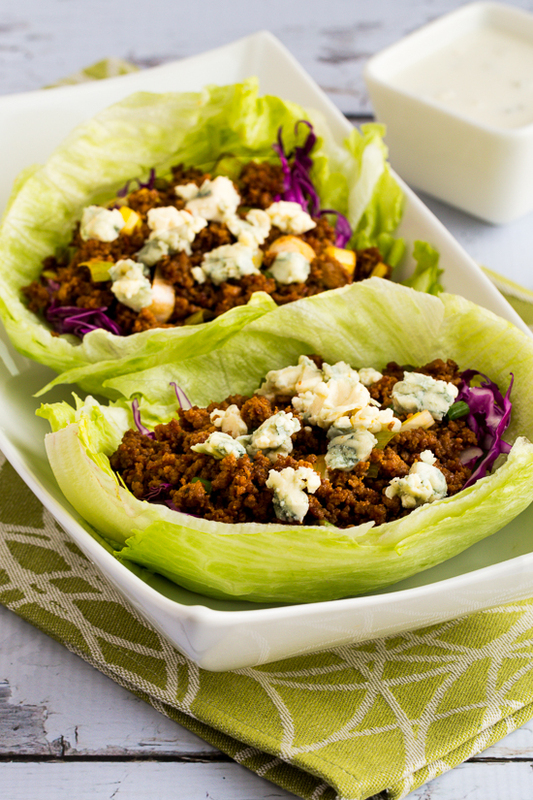 These tasty lettuce wraps would make a perfect summer dinner. Slice the green onions, thinly slice the purple cabbage (using a mandoline slicer if you have one), and crumble the blue cheese. Wash the lettuce if needed and separate into large cups. Fill each lettuce cup with a generous amount of sliced cabbage and some buffalo turkey and top with crumbled blue cheese. The buffalo turkey mixture and the sliced cabbage, lettuce, and blue cheese will keep in the fridge for a day or two, but don’t assemble the lettuce wraps until right before you’re going to eat them. This recipe would be approved for any phase of the South Beach Diet and would be suitable for most other low-carb and low-glycemic eating plans. For lowest carbs or Keto, use an approved sweetener, and you may prefer to switch ground turkey for higher-fat ground beef if you’re following Keto. 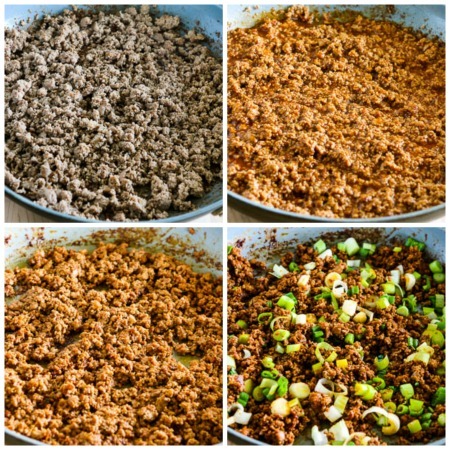 Can you make this with ground chicken? I’m sure you can, but you might need a tiny bit more oil. What other sweeteners do you recommend besides agave nectar? You can use any sweetener you prefer. I like Stevia granulated for a no calorie sweetener. Maple syrup would also be good. We love this recipe and I always double it. Leftovers are great the next day in a baked sweet potato! I love that idea; thanks for sharing! Hi Kalyn – this recipe would be perfect to make and freeze, then throw together a quick meal after work. I love the spicy kick! Thanks, I love the idea of freezing the meat! Glad you like it. I'd have to alter the sauce…allergic to chili peppers so hot sauce is banned in our house. Otherwise these look awesome! Thanks; hope you can make it work! I'm a big fan of iceberg lettuce, and what better use than to fill the crispy leaves with this Buffalo turkey? Spicy, and crunchy! Yes, it definitely works for me too Lydia! Glad you like it.